Once the children are out on their own, many empty nesters want to reclaim their space with new kitchen design choices that reflect their new mode of life. After decades of living with a dated design, the owners of this family home wanted to breathe new life into the space. The Divine team created a beautiful, grown-up space full of sophistication for their changing lifestyle. To start the renovation on the right foot, the open concept renovation started by laying modern oak with a natural stain throughout the kitchen and sitting area. This selection gave a wonderful touch of warmth to the other color selections, while uniting the two areas. To unite the look of the open concept renovation, the serving island was finished in an espresso color similar to the furniture selections in the family room, softening the transition between the two areas nicely. The first major design decision of the renovation was to design a new kitchen layout in order to create better entertaining space. To accomplish this, the design replaced the previous peninsula layout with a more modern double-island approach. This flexible new kitchen layout allowed the flow of the kitchen to carry on with one or more cooks, while preserving space for a buffet closer to the family room. After opening up the space, the double oven and microwave were moved to the back wall to further improve the flow of the prep space. In order to facilitate the new layout and add to the natural beauty of the space, the Divine team relocated several workspaces in the kitchen. The door to the pantry was replaced with a pocket door, allowing it to be neatly closed off when needed, or left open without infringing on the kitchen footprint or access to the paneled refrigerator. In addition, window placement was changed to take advantage of the light and the new positions of the appliances. 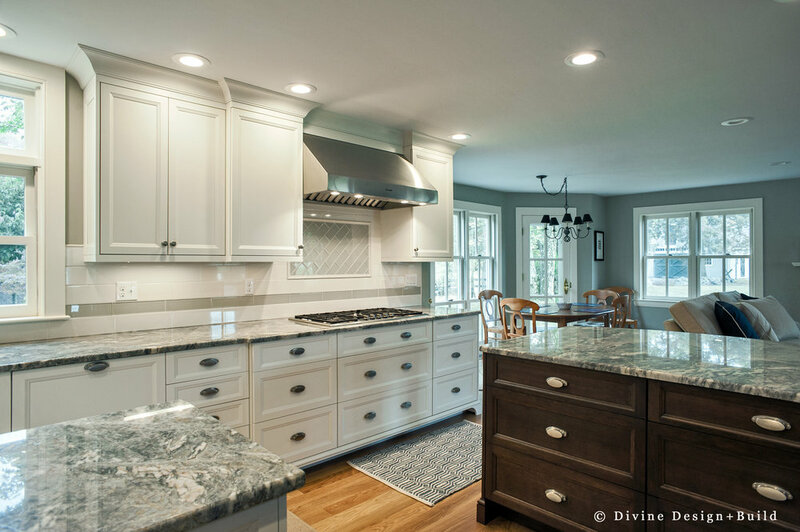 The owners wanted modern appeal and a light, airy atmosphere for the space, so the design incorporated white shaker cabinets, and a beautiful hutch piece in a mossy glaze. The hutch added visual appeal, as well as display storage for favorite pieces. It also serves as bar storage for the kitchen. The selection of a glazed accent piece complemented the wall color along the back kitchen entrance and pantry space beyond, uniting the look throughout. 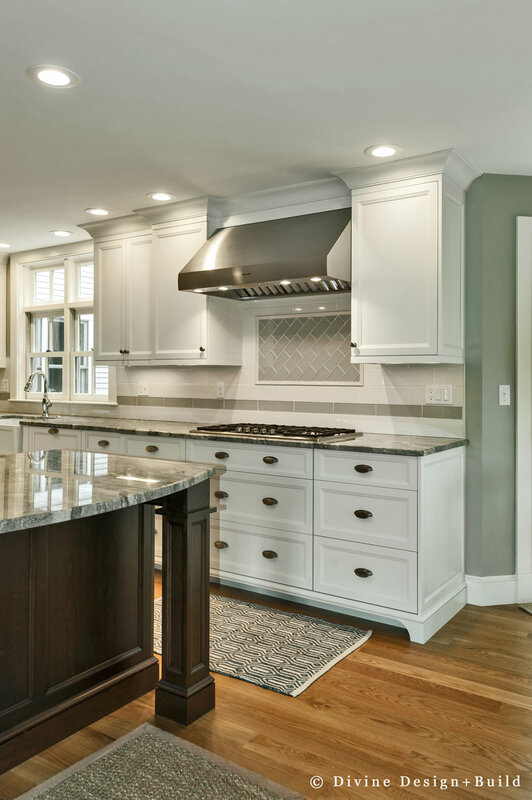 To give balance the timeless feel of shaker cabinets with modern flair, stainless accents were used, including the impressive, professional-grade stainless hood vent. 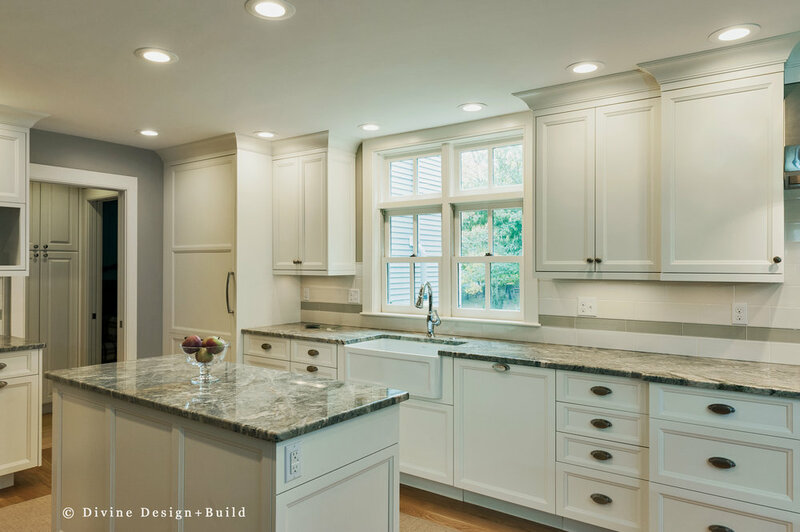 To tie together the whites and greens of the cabinetry and walls, a durable quartzite countertop in creams and browns was selected. The countertop selection, carried through the counter space and both islands, united the overall look of the first floor areas beautifully. To complement the quartzite countertop selection, a simple white subway tile with a glass tile insert was used.